It's another Saturday and that means another Review Roundup. Hopefully you're having a good one. I'm working on putting together some Guild Ball minis. Anyway, let's get right into the reviews. 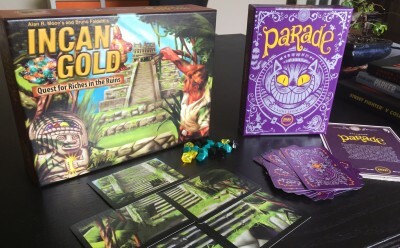 Today we have: Parade, Incan Gold, X-Wing's Eighth Wave of Expansions, Booze Barons, Kakerlaken Poker Royal, Tsuro digital app, Pingo Pingo, Raptor, Hue, Battlecruisers, Celesta, Colt Express: Horses and Stagecoach Expansion, Super11, Quadropolis, Ominoes, Curse of Strahd, and Imperial Settlers: Why Can't We Be Friends Expansion. ou know double-yolk eggs? Those rarest of treasures that whisper “It’s all going to be ok” up from the pan? Well, today you get a double-review! Enclosed within the brittle shell of this article are not one, but TWO of the greatest card games we’ve ever played, full of fatty fun and caloric goodness. Please ensure your credit card is secured in your official SU&SD fast-draw holster before continuing. We're serious. These games are very, very good. 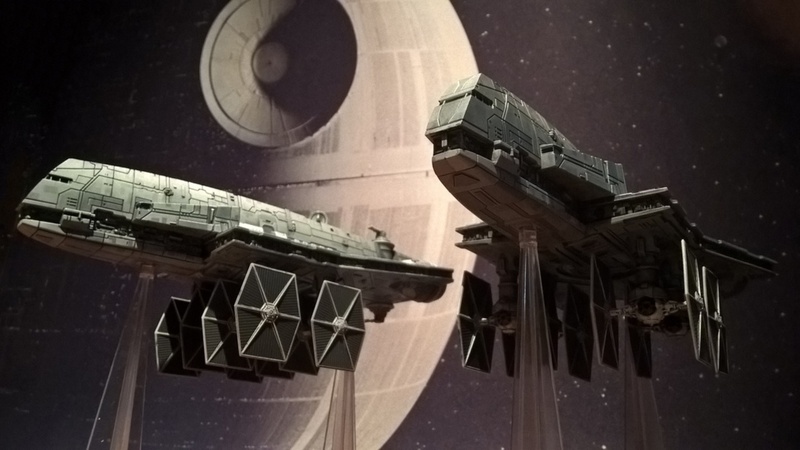 As of March, the latest round of expansions for Fantasy Flight's enormously popular spaceship miniatures game, X-Wing, is finally and fully here. The first - er - wave of Wave 8 arrived in December, so a few of these ships and cards have had longer to bed in than others. Even so, it's time to round the lot of them up and force them to answer hard questions, like: WHAT DO YOU BRING TO THE GAME? WHY ARE YOU NICE? WHY DO I FEEL COMPELLED TO OWN YOU? And: IS IT EVEN POSSIBLE FOR THE SAME WAVE TO ARRIVE TWICE? WOULD THAT NOT MAKE IT TWO SEPARATE WAVES, LIKE, IN BOTH A MARITIME AND A PHILOSOPHICAL SENSE? The answer to that last one is evidently 'yes', by the way. Haha! Eat it, Heraclitus! Booze Barons is a quick, team-based hidden identity and deduction game set during U.S. Prohibition where you are bootlegging a particular type of booze and secretly delivering it to speakeasies all over the city. Each time you make a delivery, you get a coin, but also reveal information about the type of booze you are bootlegging. Expose bootleggers of opposing mobs and help those who are in your mob since the mob with the most coins at the end wins! 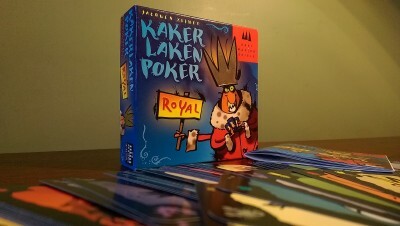 Kakerlaken Poker Royal is the European successor to the popular bluffing game, Kakerlaken or Cockroach Poker. It’s designed by Jacques Zeimet and published by Drei Magier Spiele. It can expose the cracked relationships of between 2 and 6 people, in just under half an hour. Lay out the big blind, adjust your mirrored shades and outright lie to your friends to get into the mood for our review. The first thing you notice upon opening the Tsuro app is the slick 3D animation. Great care has been made to replicate the tactile experience of the physical version and give the visuals some gravitas. There is no immediate menu, no list of options. You literally open the game box to get things going. The board smoothly flies out and unfolds, the tiles float into a neat stack, and the dragon tokens slide into view. You can even see the creases in the board from the fold. There’s a solid attention to detail here. 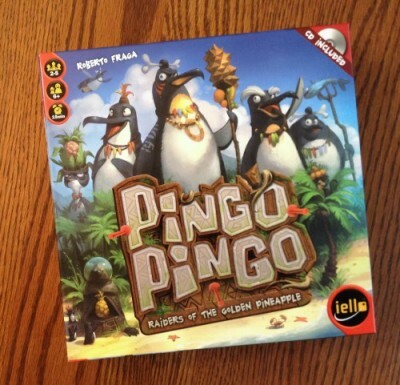 Pingo Pingo is a slapjack variant. Yes, a slapjack variant. As in if slapjack was actually fun and on steroids. Sure I could label it a real-time, dexterity game if some OCD gamer insisted upon categorizing such things. But essentially you’ll be slapping cards, shooting up the room with darts, running around, laughing, screaming, moaning, cursing and generally belittling each other for fifteen minutes. Categorize that! Simply put, you don’t play many board games like this. Or if you do, then I want to hang out with you! The best word I can find to describe Celestia is ‘delightful’; maybe even 'whimsical', how about delightfully whimsical. 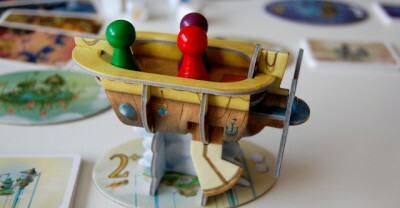 Celestia, a reprint of Cloud 9 with a slight re-theme and much better art, is a game of pushing your luck while navigating floating islands and searching for treasure. But it's a dangerous journey, and you'll have to fend off pirates and murderous flocks of birds as well as the machinations of the fellow crew. Recently I reviewed one of my favorite action programming games, Colt Express. Set in the Old West, Colt Express pits players against each other as they try and rob a passenger train. As with any action programming game, Colt Express is filled with a good amount of excitement and plenty of chaos. Recently, the designer of Colt Express decided to head back to the locomotive and bring us an expansion. Enter Colt Express: Horses and Stagecoach. As you might have guessed, this expansion brings horses and a stagecoach to your Colt Express game. How does it work well with the base game? Time to find out! In this video you can find out my final thoughts on Super11. In this video you can find out my final thoughts on Quadropolis by Days of Wonder. Toucan Play that Game review of Ominoes from Yay Games. 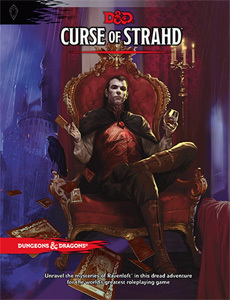 Curse of Strahd is Ravenloft for 5th Edition Dungeon and Dragons. This module revisits this classic adventure and gives you ways to add more horror to your current campaign. 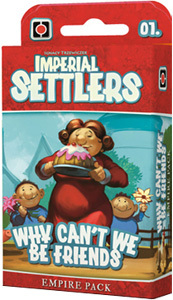 Why Can’t We Be Friends is a 55 card expansion. It adds more common and faction cards and introduces some deck construction to the game.